Financial institutions have invested heavily in increasing their online presence and providing customers with a plethora of remote/home banking options. By providing customers access to these features within the branch, you can leverage your online capabilities with little to no additional costs. Allowing customers to fill out forms online can avoid mistakes due to handwriting, and decrease the time taken to process applications for accounts, loans, credit cards, mortgages, and more. If you are running promotions, or special offers, it is important to share that information in as varied a method as possible. Displaying ads or offers on an interactive kiosk is just another way to get “impressions” on a particular promotion. Even better, allowing customers to print particular product packages or offers will minimize traditional print costs and increase awareness. You can use a kiosk to promote and educate your customers about online capabilities. You can do this via tutorial videos and documents or staff demonstrating and teaching on the kiosk. KioWare is kiosk system software currently used by over 350 financial institutions in over 40 countries around the world. Deployments range from over 800 kiosks spread over hundreds of branches to a kiosk in a single branch. Compare: Use our comparison chart to select the right KioWare product for your project. Why do you need kiosk software for your kiosks? Kiosks have three main components. They start with hardware (a computer or tablet that is secured physically with a kiosk or tablet enclosure). With KioWare, your hardware can be running Android or Windows OS. The second component is the customer facing application. This is the website or application with which customers will be interacting. It is usually the financial institution website, or mobile application, but it can also be a custom built kiosk application that performs a particular function or task and is developed specifically for use on kiosks. If you need a custom kiosk application, the KioWare Custom Development Team can provide expertise to meet your needs. The third piece of deploying a kiosk is kiosk software. This is the underlying technology that protects your device, network, customer, and data. It serves all of the following functions, and more. Most simply, you can set up kiosks to share your mobile application or website with customers. With a kiosk that is locked down only to access your online presence, the bank website and/or application is being promoted and shared, and bank personnel can assist customers with setting up their first time account access or educate customers on how to utilize online features. By securing a kiosk to display a video, you can also share tutorials or other educational content with customers via an unattended bank kiosk. Kiosk software can secure your device to access only allowed websites or applications. By setting your branch kiosk to access your bank/credit union website, customers can use the kiosk to perform any interaction that would typically be performed at home. Checking account balances and cleared checks, transferring funds between linked accounts, paying bills online, and more, can be done by providing customers with access to their accounts via a kiosk secured to share the bank/credit union website. Kiosks are also a great way to avoid processing page after page of handwritten financial and personal information. Allowing customers to fill out forms online can avoid mistakes due to handwriting, and decrease the time taken to process applications for loans, credit cards, mortgages, and more. Customers may need services that are either peripheral to the bank or credit union, or require more time and information to complete. Ordering checks or applying for a credit card can both be done online (with existing applications). Similarly, checking one’s credit is financially relevant, but not a service typically offered at most branches. Opening an account is often a tedious bank process, so filling out the forms online and printing them is a great option to increase customer satisfaction. Running an online credit check can be done via kiosk rather than printed forms or accessing the internet from home. Customers often times just need to request something from the teller or bank staff. Whether they be requesting a currency exchange or an appointment with a bank manager to go through account information, allowing customers to submit requests via kiosks will streamline the wait process and optimize bank resources. Even something as simple as viewing the current currency exchange would be useful to the relevant customers. If you are running promotions, or special offers, it is important to share that information in as varied a method as possible.Displaying ads or offers on an interactive kiosk is just another way to get “impressions” on a particular promotion. Even better, allowing customers to print particular product packages or offers will minimize traditional print costs and increase awareness. Kiosks can be set up to not only display information in a secure and restricted manner, but to print information, and (with the proper kiosk software set up utilizing a retractable printer) maintain proper security for any personal or sensitive financial data. Other information to be shared is general financial tutorials on budgeting or investing, as well as upcoming events and opportunities. If the credit union or bank is sponsoring a race, or advertising at a concert, those may be external events worth promoting via a branch kiosk. Kiosk software is an integral part to any financial institution deployment of kiosks, particularly given that banks have to consider maintaining PCI (Payment Card Industry) Compliance. KioWare can be found in banks and credit unions around the world and is available for Windows & Android devices. One important aspect of kiosk software that is often useful, given the multiple branches and geographic location typical to the banking industry, is kiosk management. Remote kiosk management via KioWare Server or KioCloud allows for accessing usage statistics, monitoring kiosk health, and updating kiosk content and configuration files. KioWare kiosk software secures your application or website on Windows or Android devices, restricting user access to approved behaviors and protecting user and network data. KioWare is fully customizable and offers solutions ranging from browser lockdown to full server-based kiosk management. From simple out of the box configurations to more complex integrations, KioWare is trusted by developers, IT professionals, marketers, Fortune 100 corporations, and small business owners. The KioWare team is based in York, Pennsylvania, with an office located in Reading, UK. 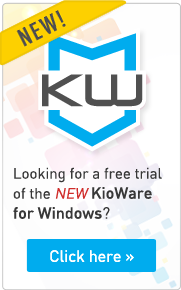 Choose the best KioWare product for your self-service project and download a fully functioning free trial at KioWare.com.